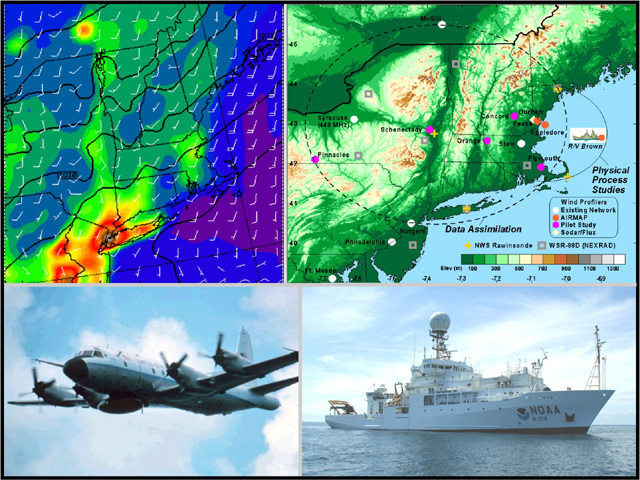 What: The focus of NOAA's field study includes airborne measurements using the NOAA WP-3D aircraft and a remote sensing aircraft, surface measurements using the R/V Ronald H. Brown mobile platform, and ground-based sampling at Chebogue Point, Nova Scotia. Who: Investigators in this project include researchers from numerous universities, industries, and governmental organizations. Participating institutions include the University of Colorado CIRES. This comprehensive research effort regards many aspects of tropospheric research, including emissions verification, transport and mixing, chemical transformation, aerosols and their radiative effects and forecast models.